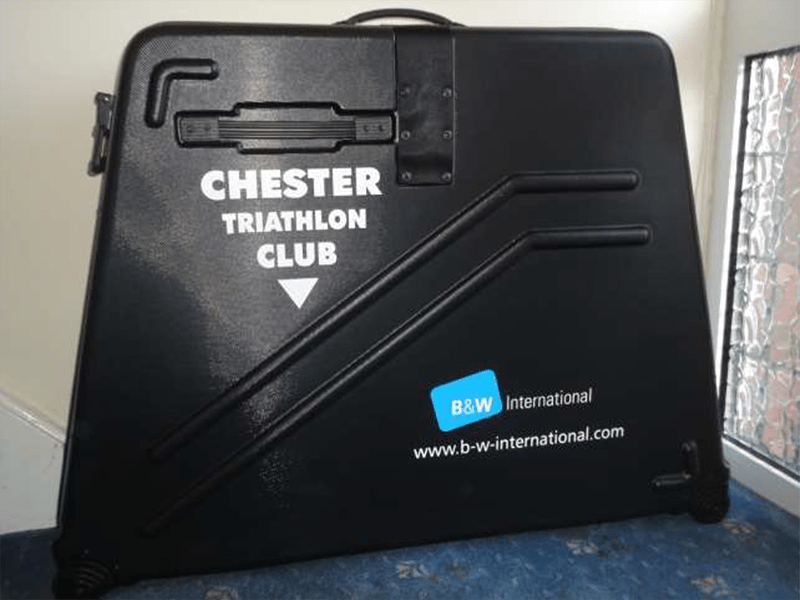 Any Chester Tri Club member can hire a club bike box. A small charge of £10 for up to 2 weeks or £20 for 2 to 4 weeks is required to cover the running costs of the boxes. The maximum loan period for any loan is normally 4 weeks. You can check out bike box availability here. To book a box or make an enquiry, please email bikebox@nullchestertri.org.uk detailing the loan period required (start and end dates, allowing 2 days either side for hand overs). Check the case, hinges and latches for any damage before leaving baggage control at the airport on both out and return flights. If any damage is observed, report it to the airport baggage desk immediately. If you do not do this, the airport will not accept liability for damage due to their handling. As a condition of the loan, you will be expected to make a claim on your travel insurance in the event of any damage incurred during your loan period. At the same time, check your bike is okay for the same reason. Clean your bike before travelling out and before returning from your trip. Either, remove your chain and cassette and store in a suitable bag/box before packing with your bike. Or, wrap your cassette/chain-set to eliminate contaminating the box with oily chain dirt. Simply wrapping in newspaper and taping in place should be fine. The Bonza Bike Box is a strong and rigid travel case made from High-density polyethylene (HDPE), designed to transport and protect your bike when traveling abroad. internal foam padding separating the wheel compartment, thus protecting your wheels, frame and other packed accessories. anti-crush technology in the form of two support struts. These act as additional protection should the case sustain a large impact, helping to prevent the bike from being crushed should the HDPE outer casing fail. velcro retention straps for your frame and accessories. Two integral handles for ease of carrying/moving the case around. Large foam protector keeping the wheel compartment separate from the frame and other packed items. Two anti-crush struts with hex-key skewers for front and rear wheels. External dimensions: 124 x 94 x 34cm. Weight: 12kg including foam and packing accessories. There are also two useful videos available at the aforementioned site demonstrating both the packing of a Bonza bike box and the fitting of the anti-crush struts. Remove or cover the cassette and chain to avoid contaminating the box and contents with oily dirt (wrapping in old newspaper and taping with masking tape does the job). Remove (or cover as above) the rear mech’ and tape to the chain-stay (removal is optional but advised where the mech is vulnerable, i.e. close to the wall of the box for larger framed bikes). It is advisable to pack your box with soft items (e.g. clothing in plastic bags) to help stop items moving around and potentially causing damage. Use of pipe insulation (foam) is also an option for protecting frame tubing. There is an absolute flight weight limit of 32kg for this type of item, however, your limit may be lower depending on your flight booking. Check the maximum weight allowance and ensure you do not exceed this.